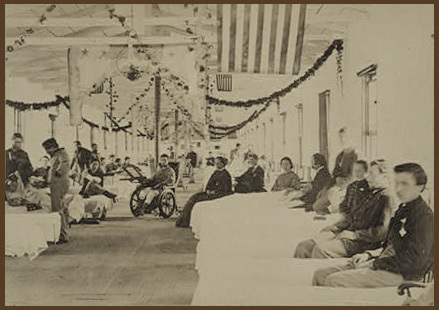 Exterior and interior views of hospitals, ambulance trains and medical corps. Mathew Brady Collection of Photographs. Washington : sans publisher, sd (1861-1870). Description : ca. 110 photographic prints ; 28 x 36 cm. or smaller. Photographs : albumen and gelatin silver, originals and later reprints. Repository : Library of Congress Prints and Photographs Division Washington, D.C. 20540 USA. Cited : Washingtoniana Photographs ; Washington, D.C. : Library of Congress, (1989). PPOC Catalog Url : http://www.loc.gov/rr/print/catalog.html. PPOC call number : 2004667332. The 19th century gold-toned originals were acquired from Col. Godwin Ordway in 1948. Some prints made to order by the Handy Studio in 1905. Other later reprints from the Anthony-Taylor-Rand-Ordway-Easton collection of negatives. Worldcat number : (OCLC) 55940204. Exterior and interior views of hospitals. Ambulance trains and Medical Corps work. Work of the U.S. Sanitary Commission. Includes wards and exterior views of Armory Square Hospital, Campbell Army Hospital, Mt. Pleasant Hospital, Harewood Hospital and ambulance train, surgeons and hospital stewards, Sanitary Commission Lodge, Soldier's Rest, in the square of North Capitol, Delaware Avenue, and C and D Streets NE; Stanton Hospital, tent hospital at Randall Green, Quartermaster's Hospital, Douglas Hospital, and Kalorama Hospital, in Washington. Seminary Hospital, Georgetown. Slough Hospital, Sanitary Commission at Convalescent Hospital, exterior views and kitchen of Soldier's Rest, and Mansion House Hospital, in Alexandria. 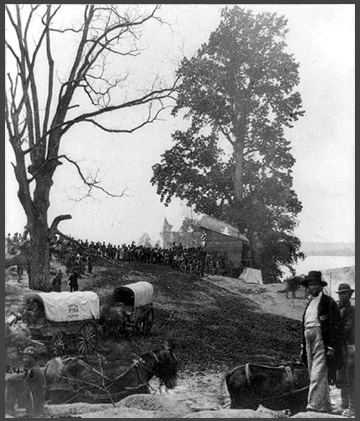 Sanitary Commission at Belle Plain Landing, Va., May 1864.